King Philippe and Queen Mathilde of Belgium celebrated their country’s national holiday today by attending aTe Deum at the Cathédrale des Saints Michel-et-Gudule in Brussels with their young family. Queen Mathilde wore a dramatic dark orange straw picture hat with an asymmetrical brim. The focus of this new hat, designed by Fabienne Delvigne, was the rough, shredded edge of the brim. I’m not sure if this unfinished straw leans toward the festive… or the messy. I do however, believe that Mathilde is one of the few royal women who looks beautiful in orange. It’s a great colour on her. Little Princess Eléonore wore a pale pink bow in her hair while Princess Elisabeth added pale pink roses to her curled chignon. This afternoon, the royal family was joined by the King’s siblings for the annual military parade along the Place des Palais in Brussels. Princess Astrid of Belgium, Archduchess of Austria-Este wore what I believe is her Lieutenant-colonel uniform and hat from her time in the Belgian Medical Component. Prince Laurent wore his naval uniform and cap while and Princess Claire topped her white lace dress with a flat black bow fascinator. Black and white is always a classic look although I would have preferred Claire in a full-on hat. It was lovely to see her and Prince Laurent looking so animated after his health struggles earlier this year. King Albert and Queen Paola did not attend this event- a decision, presumably, to keep the current King and Queen at the center of national day festivities. What did you think of Queen Mathilde’s showstopping hat today? This entry was posted in Belgium and tagged Princess Astrid, Princess Claire, Queen Mathilde. Bookmark the permalink. it’s FABULOUS!! I love that she has the guts to try something like this. It’s not my favourite hat, I’m not so fond of the ragged edge look, although it is dramatic in scale. It looks better on Mathilde from the back, somehow! So I would probably think of reducing the size quite a bit, although Mathilde looks superb in orange. Having said that, I do think that of all the royal occasions to wear a Big Hat, a national day like this is one of the most suitable; it ensures visibility among crowds seeing one from a distance in real life, as opposed to the majority of public engagements where there are small crowds present on person and the focus of the look may be more appropriately on how well it photographs. Something is “off” when your four children have better, classic style than their mother. While I have not been a close follower, I have always thought Queen Mathilde to be extremely beautiful, but seemed to be better sartorially put together in earlier years. Perhaps, I am forgetting, but her style, including her hats, seem to have taken a turn for the worse this last year. Have to add: this is a beautiful family. It is a kind of hat Fabienne Delvigne makes every summer, in different colors, very recognizable her style. It looks elegant but is not all that easy to wear, but Mathilde wears it with flair. Yes she looks great in this color, it really suits her, the hat, way over powering on her, it is toooo much for her, maybe a smaller hat in the same style would look better. And the dress, why 2 different types of sleeves? It looked messy to me, unfinished. Her daughters, looked lovely, just lovely, sweet and pretty. Princess Claire, so nice to see her, even thought it wasn’t a real hat, she looked pretty and happy. It is slightly too large for her but overall I love her look and it ensured she was the focus of the day. I could see Maxima in this too ot would be ideal for a Dutch queen! 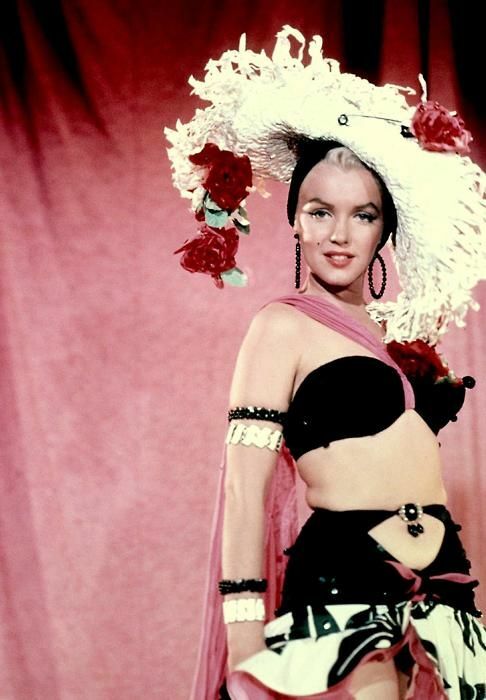 MrFitzoy, unfortunately, saw this, and immediately thought of Marilyn Monroe’s hat for the Heat Wave number in “There’s No Business Like Show Business”…….not, one thinks, what Queen Mathilde was probably trying to evoke. Its just too big, too messy, and as another clever commenter perfectly stated, looks like Lucy after she climbed out of the starch vat. As someone who usually loves QM’s iconoclastic hattery… this one just fails. Especially with the adjacent princesses dressed so perfectly prim. Plus, now that song has been stuck in MrFitzroy’s head all day. “She started that heatwave, by making her seat wave…. She’s bitten off more than she can chew here. For some reason I think Max can just about make this work, but it swamps Mathilde. Max also has a version of this dress too, in brown I think. Ladies please – start shopping somewhere else!! I usually like big hats, but in this case, the hat is too big for Mathilde. It does not seem to fit her head properly. I also don’t like the trim around the edge of the hat. All anyone will be looking at is the hat; it’s a distraction, and that’s never what you want. I think the hat would be better if the print of the dress were less busy…all of that detail together is overwhelming. Love it or loath it, it’s a striking hat that’s for sure! I mentioned in an earlier post that I kinda like the fringed, textured look in fashion as long as it is tasteful and subtle. I think this falls a bit short and borders on messy as you say, especially close up….and it is pretty big!!! Not a real fan of the different sleeves on the dress either, probably would have liked both caped. Love Princess Elizabeth’s pale blue coat though, very stylish. Thanks. So glad to see her in a bigger hat, and I agree this is a fabulous color on her. I just fear she has gone to the opposite extreme and this is TOO big and overpowering. Surprised by Claire’s fascinator. If memory serves, she has in the past worn larger hats to the parade, even if she wore something small for the service. I find it big bright and unbecoming to the point of being ugly. In my opinion it actually detracts from Mathilde’s appearance and that’s the last thing you want from a hat. Somehow that doesn’t pleasemy eyes so much. It is just a little too big and the shred isn’t very elegant. The oranges don’t quite match on her outfit and hat either, and all I liked were her shoes! In that hat Queen Mathilde looks like Lucy Ricardo after she fell into the starch vat. I agree that Queen Mathilde looks good in orange, and brimmed hats suit her well too, but I hate the shredded edging of the hat, as it reminds me of the time my friend’s new hat that she bought for the races got chewed and shredded up by her dog. I also don’t get the purpose of her left sleeve being a cape sleeve, and the right sleeve being fitted, as it looks odd. Princess Claire’s white lace dress was elegant, but I do tend to think lace dresses are more suited to cocktail wear than day wear, and the flat black bow fascinator looked rather twee and unsuited to a church service. 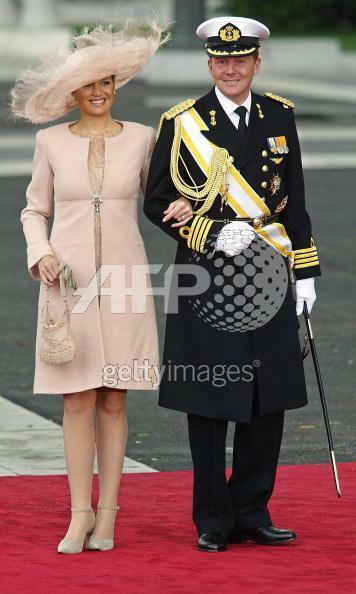 Queen Máxima wore the same hat in in light pink in May 2004, at the wedding of CP Felipe of Spain and Letizia. Both Queen Máxima and Crown Princess Victoria of Sweden have worn similar hats, also by Fabienne Delvigne. Not a big fan of the shread but Mat can wear it well and I like seeing her in a large hat and not one of the Max wrap thing the 2 ladies have been sporting.